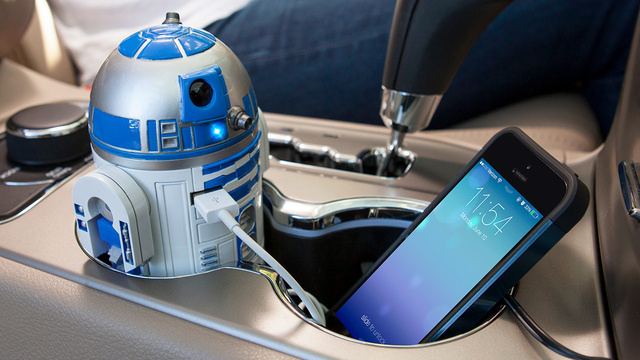 This Is The Cup Holder Charger You've Been Looking For | OhGizmo! Is it even possible to write about R2-D2 without making that reference? We suppose amongst more talented writers it is, but that’s the kind of quality content you get here at OhGizmo! In any case, you’re looking at a USB-charger that sits in your car’s upholder. It plugs itself into the cigarette lighter and then provides electricity to whatever gadgets of yours recharge through USB. Its arms are adjustable, which allow it to fit in almost any size holder. There are two ports, and what appears to be an LED, for good measure. It’s $50, which is only a lot of money if you hate Star Wars.